Shapers: An art workshop at Bookaroo 2008. If you caught Bookaroo in New Delhi last year, you would know that the festival was as much fun for adults as it was for children. Book-reading sessions under a banyan tree, sketching on a doodle wall and getting to meet authors your children love—a great way to spend the weekend. The festival is back this year with 64 events and 44 authors and performers as opposed to 44 events and 26 authors last year. Among those to watch out for are Andrew Cope, the author of the best-selling Spy Dog series and of self-help books for children; Muriel Bloch, one of France’s leading storytellers; Namita Gokhale and Alister Taylor, who will bring epics such as Mahabharat to life; Benita and Moen Sen’s workshop on creating useful things out of waste paper; and Michael Panckridge, who will talk about cricket legends. 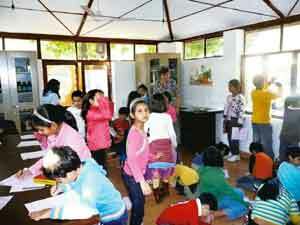 “This is a platform for children to see various aspects of art, and its association with books. That’s why, apart from book readings, we have included non-storytelling events to attract more children to books," says M. Venkatesh, a founder member of Bookaroo and the children’s books columnist for Lounge. Both the organizers and workshop conductors are clear that they don’t want rigidly tailored workshops. “I am not going to give the children any topics or tell them what to design on the doodle wall," says Atanu Roy, an author and illustrator who will be conducting the “Mr Amazing" art workshop. A view that is echoed by Andrew Dodd of Campfire books: “We are organizing two cartoon-drawing workshops—‘Doodle Dandy!’ by Bhupendra Ahluwalia and ‘Crazy Toons!’ by Sankha Banerjee. The brief we have given to both our illustrators is to make these sessions interactive and let the children have fun without being told what to do." Campfire books is also organizing a show with puppeteer Varun Narain based on their latest book Alice in Puppetland. Among the highlights of the festival is a Dastangoi performance by Mahmood Farooqui and Danish Husain on 28 November which is open for all. “We have done a few performances earlier for children but this is the first time we will be doing it for a large, mixed age-group crowd. We have two pieces scheduled, one for older children based on what we already do and another story about children going to school. It is an experiment for us too, one that we hope works," says Farooqui.